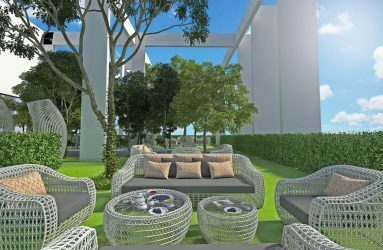 Welcome to Bellevue Residencies, a unique opportunity to be part of a community residing in the lap of luxury whilst setting a benchmark for modern high-rise living in Ja Ela. Overlooking the scenic views of the many tranquil and calm surroundings in Ja Ela, Sri Lanka, Bellevue Residences consist of 177 supremely spacious, meticulously designed apartments spread across 33 floors. The leading construction and engineering firm in Sri Lanka, Maga Engineering has successfully completed over 400 multi-disciplinary projects in both Sri Lanka and overseas. From an array of luxury hotels, apartment buildings and hospitals, to public infrastructure development projects such as highways, bridges, airport buildings and water supply schemes, the company has built a reputation for quality & timely delivery of large-scale projects. Maga’s recent forays have included the tallest building in Sri Lanka, Clearpoint Residencies; the World’s Tallest Vertical Garden as well as the country’s longest road rehabilitation project. The company’s focus on sustainable buildings has manifested through its role in constructing the world’s first LEED Platinum-certified manufacturing plant, MAS Thurulie. Maga has the distinction of being the only Platinum rated construction firm in Sri Lanka’s Corporate Accountability Index, a testimony to the trust placed on the company by its stakeholders. The name Bellevue; which stands for beautiful view comes from the French heritage and 20 years of real estate development experience in France by the owners of Riviera Ventures, owners of Hikka Hide Villas; Hikkaduwa and other numerous real estate investments in Sri Lanka. Built on over 40 years of local and international experience and an innovative and forward-thinking approach to architecture, Milroy Perera Associates is an established design firm, experienced in building design in many disciplines with a portfolio that showcases their versatility: From the impressive structure that is the British High Commission in Colombo (for which they were local architects), the lavish Blue Waters Hotel in Wadduwa, the multi-purpose auditorium of Ananda College, the towering Access Tower on Union Place, to the jewel of their achievements — the Kandalama hotel in Dambulla, which has received multiple awards and praise for its eco-friendly design. Upscale residential apartment complexes that Milroy Perera Associates have previously been involved in are Fairway Residencies, Fairmount Residencies, Radion Residencies, The Fairway Sky Gardens and the most recent landmark design marvel nearing its completion, The World’s Tallest Vertical Garden; Clearpoint Residencies. Bellevue’s spacious, luxurious and beautifully envisioned living spaces are available in 2 bedroom, 3 bedroom apartments and Penthouse Suites to suit your specifications and desires. Every little detail has been meticulously thought out and will be executed to the highest international standards. From a fully equipped gym, family friendly pool area and recreation areas in which to enjoy the serenity of nature; to a food court featuring delectable cuisine and a shopping mall complete with supermarket and outlets catering to all life’s necessities, Bellevue has been designed with our ease in mind. Reserved parking, round the clock security and absolute privacy, will serve to make your dreams of an ideal lifestyle, a complete reality. Located 10 minutes from Colombo, just off the Ja-Ela exit of the Colombo Katunayake expressway, Bellevue Residencies is a private metropolis equipped with modern amenities guaranteeing a comfortable and secure lifestyle for you and your family. Bellevue’s spacious, luxurious and beautifully envisioned living spaces are available in 2 bedroom, 3 bedroom, 4 bedroom apartments and Penthouse Suites to suit every homeowner and investor alike. 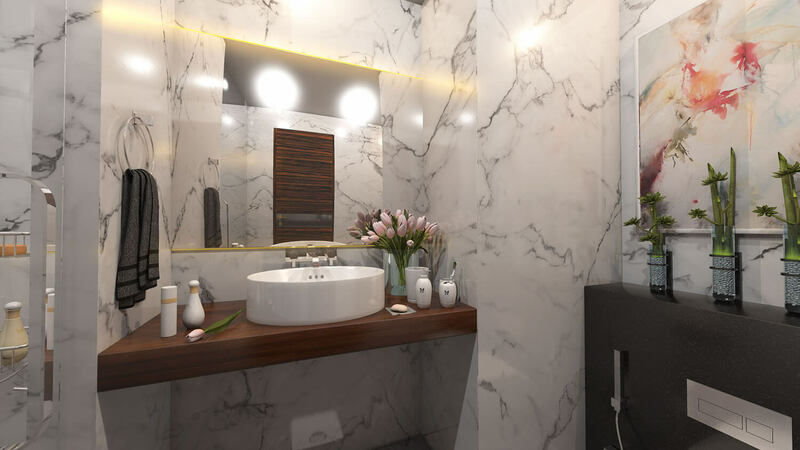 Guided by its cutting-edge yet holistic design approach, the building will feature many modern features that will assure its residents the best of apartment living, whilst providing a level of comfort and luxury that is truly in harmony with nature. Come experience the sensation of tranquil living with the panoramic views of a high-rise abode. Bellevue Residencies is a 33 storey modern high-rise in Ja Ela. Overlooking the scenic views of the many tranquil and calm surroundings in Ja Ela, Sri Lanka, Bellevue Residences consist of 177 supremely spacious, meticulously designed apartments spread across 33 floors. Located 10 minutes from Colombo, just off the Ja-Ela exit of the Colombo Katunayake expressway, Bellevue Residencies is a private metropolis equipped with modern amenities guaranteeing a comfortable and secure lifestyle for you and your family. Who are the developers of Bellevue Residencies? Bellevue Residencies is a joint venture between Riviera Ventures Pvt Ltd and Maga Engineering Pvt Ltd. Sri Lanka’s only Platinum rated construction company, Maga Engineering is the country’s market leader in the sector and has made an indelible imprint as Sri Lanka’s most trusted constructor. Built on over four decades of local and international experience and a forward-thinking approach to architecture, Milroy Perera Associates is one of the most established architectural firms in the country. Tell me more about the apartments? The building consists of 177 spaciously designed 2, 3 and 4 bedroom apartments, and a limited number of penthouses spread over 33 floors. What is the selling price of an apartment? The apartments are competitively priced according to the size of apartment, orientation and special features and based on the time of apartment reservation. Please contact our Sales Hotline on +94 715 150 150, +94 703 789 789 or alternatively proceed to the Contact Us section of this website and send an e-mail to our sales team who will be glad to assist you. Where can I see the floor plans of the apartments? 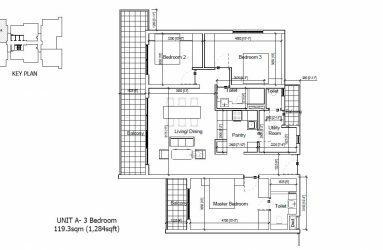 All apartment floor plan types can be viewed under the Floor Plans tab of this website. Further details about the apartments and their features can be obtained (including the ability to go through the floor plans in greater detail) by visiting our Sales Office located next to the project premises in Ja-Ela. Bellevue Residencies is scheduled for completion in 2021 and you will be able to move in immediately after completion. Is there any loan scheme for me to purchase my apartment? Financing facilities are available through tripartite loan schemes via several reputed banks that will allow you to finance the purchase of apartments under construction. Our sales team will gladly assist you with further information. All apartments are constructed with materials and fittings of the highest quality and specifications, including high quality porcelain floors, wall tiles, state-of-the-art cabinetry and air-conditioners to name a few..
Tell me about your security arrangements? Bellevue is well secured with both human and electronic surveillance systems. Highly trained security personnel together with the latest technologies is provided for effective and efficient surveillance. Furthermore, our construction solutions such as special glass windows and fire detection systems etc. are guaranteed to offer more peace of mind for residents. I am not a citizen of Sri Lanka. Can I buy an apartment in Bellevue Residencies? Yes, a foreign national can purchase apartments in Bellevue Residencies as long as they are above the fourth floor. Who will manage Bellevue Residencies after the project is completed? Bellevue’s developers will appoint a special administration team with the required credentials and expertise to manage the day-to-day activities of the condominium. With our experience in handling several large-scale local and international projects of this nature, systems will be put in place to ensure the proper management of this property. Copyright © 2017 BELLEVUE RESIDENCIES. All Rights Reserved.